---------------------------------------------------- Turkmen folk art is best known for its pile-woven carpets, which, apart from being essential in the household, were from a very early date an important export commodity. Their extraordinary variety and beauty stem from their method of execution-hand-weaving. Weavers, mostly women, are introduced to the craft in early childhood and gradually master all the processes of this difficult time-consuming art. There once existed flourishing towns and villages in the agricultural oases of Turkmenia, which were wiped out by bloody, devastating wars. By the eighteenth century Merv, Nis, and Tedzhen had declined. Pottery was no longer made. The only surviving industries were silk-weaving, carpet-making, and goldsmithing, which catered to the local nomadic and semi-nomadic population. 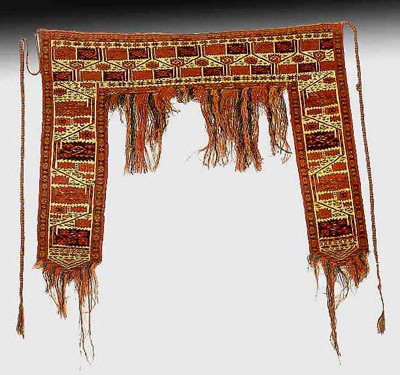 Felts were produced for covering yurta tents, floors (carpets were also used), and for making sacks and bags in which clothes and utensils were kept. The Turkmen women weavers are skilled in making all types of carpets-piled, flat-woven, and woven in a mixed technique. Their mastery is demonstrated by the density of pile and the correspondence of the density to its height, which enhances the design's clarity and vividness.